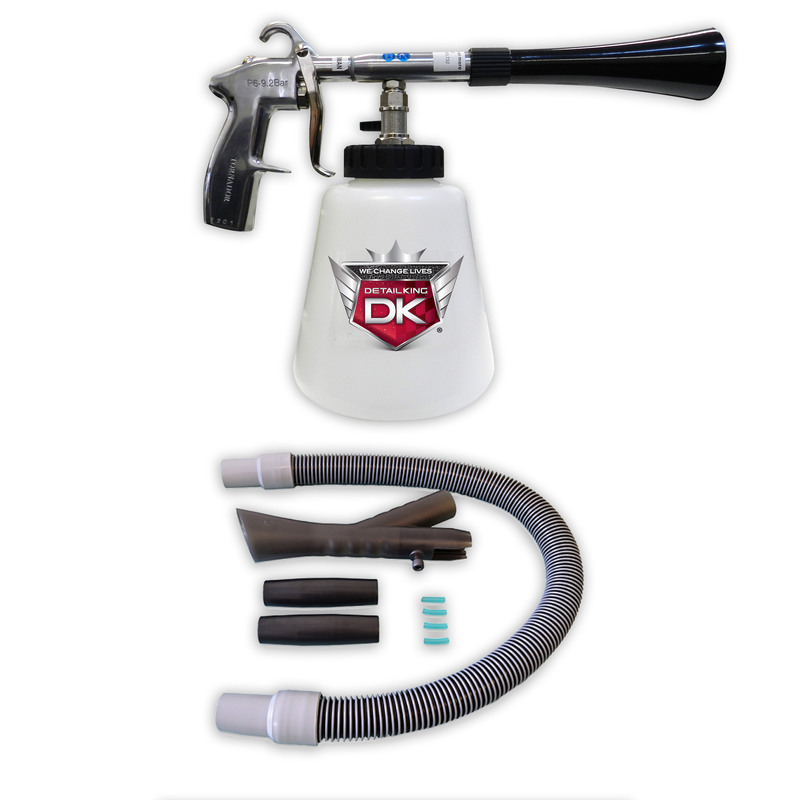 The Tornador Black Z-020 and ZV200 Velocity Vac Kit is the perfect interior detailing value package for detailers who want to speed up their detailing times. This Kit includes the Tornador Black Z-020 and the ZV200 Velocity Vac to help you clean plastic, vinyl, and remove dirt, sand, and much more from carpets, mats, and upholstery! The Tornador Black Z-020 Interior Cleaning Tool is a pneumatically operated suction spray gun which very finely atomizes soap, water and air and dispenses it under high pressure. It removes dirt and grime quickly and uses lower consumption of the cleaning product (Tornador Super Soap). The newly developed rotation-set in the nozzle of the new Tornador BLACK is more powerful and cleans faster than the original Tornador Interior Cleaning Tool Z-010. There is No wear of rotary hose and funnel as the medium guide is ball-bearing and does not come into contact with the nozzle. For professional car detailing companies the new Tornador BLACK is a must-have! You will save time, energy and cleaning chemicals, because the new Tornador BLACK works more powerful and more efficient on less air-pressure than the original Tornador. The compressed-air driven suction feed gun rotates spirally during operation and loosens dust particles with extremely high power from the surface. Makes cleaning an interior a cinch! The new Tornador Black comes standard with an air-regulator so you are now able to change the working pressure directly on the tool and also to regulate the capacity of chemicals accurately. CLICK HERE for the Tornador Black Data Sheet and Usage Instructions. The Tornador ZV-200 Velocity Vac is a innovative tool made to be equipped with the Tornador Black. By combining the outstanding cleaning power of the patented Tornador Black with the innovative Velocity Vac, automotive detailing will never be the same again! Utilizing this tool will make automotive upholstery and other cleaning tasks quicker and easier than ever! • Cone Vacuum Hose 34"
Did you misplace your Tornador ZV-200 Velocity Vac Manual? EVERYTHING INCLUDED IN THIS KIT WOULD COST: $269.90 You Save: $21.59!